Do you have some ripe bananas? Need a recipe to make with them? Give these bars a try! My sister has been making this recipe for a year or so now which comes from The Girl Who Ate Everything. She is not a chocolate person at all (unlike me) and always brings these when she is in charge of dessert. They are amazing! 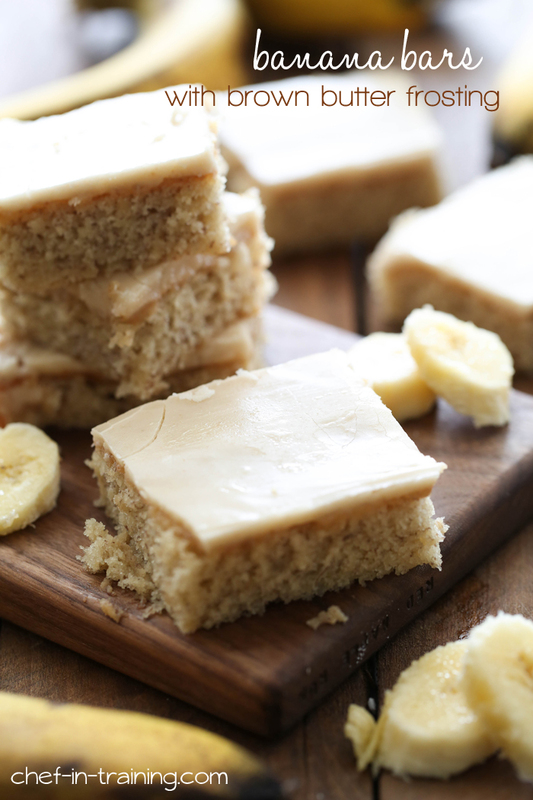 The Brown Butter Frosting is similar to one that is already on the blog, but compliments the banana flavor PERFECTLY! This recipe is just like Banana Bread, only more cake like and made into bars :) You definitely need to give these a try- you won’t regret it! These bars are so soft and delicious! The perfect way to use up some ripe bananas! Grease and flour 15 by 10 inch jelly roll pan. In a large bowl, beat togehter sugar, sour cream, butter and eggs until creamy. Blend in bananas and vanilla. Add flour, baking soda, salt and mix until well combined. Spread batter evenly into pan. Bake 20 to 25 minutes or until golden brown. Make while cake is baking. Heat butter in large saucepan over medium heat until boiling. Let the butter turn a delicagte brown and remove from heat immediately. Add powder sugar, vanilla,and milk. Whisk togehter until smooth, (it should be thicker than a glaze but thinner than frosting.) Using spatula, spread the frosting over the warm bars. I am a chocolate person but these bars with the browned butter frosting sounds amazing. I will be making soon. the bananas by pulsing them in my cuisinart for about 5-10 seconds. They come out perfect for a recipe like this one. I'll be trying the banana cake this week. Yummy. what did I do wrong?! I only got 2 cups of the powdered sugar in before it turned into a thick, pasty mess with the glaze. I had the same thing happen! Thank goodness you directed me to the source recipe for the correct measurements! Nikki may want to update her version with the corrected measurement. Can't wait to try these! Just letting them cool now! Bad mistake in frosting milk measurement. I used 5 tbs of milk. These are truly a good recipe. KEEPER! Taste exactly like they sound. These were excellent! I just made them tonight. Has anyone tried adding chocolate chips? Also at the top of the page it says "For those that follow me on instagram, you may have seen my post some bars- these are NOT them" Which bars are those??? These were so yummy! These are so moist and tasty, easy to make and everyone loves them! I have made them twice and received numerous compliments:) I even used whole wheat flour for one-half of the flour, and I used crème cheese frosting. I would like to make this for my School. But i Need to know how many calories are in a serving. can u help me ? Adding a pinch of salt to browned butter icing really enhances browned butter icing. Even if we use salted butter? Made these for Thanksgiving and had to make 2 extra batches for the company. Highly addictive! VERY VERY GOOD. Hello there! I'm new to your website and this recipe looks like what I need in my life right now! I had a question on the bananas. I don't have any ripe bananas at home so when I do go to the grocery store, could these bars be made with fresh bananas/bananas that hasn't ripen yet? Or will it take away from the entire taste aspect? Thank you! I made these bars at my Cafe...they loved them!! I also made brown butter banana ice cream, it's all good!! Gonna make another batch for a party on Saturday, spreading the Brown Butter Banana Bar Love! This version is perfect!